Will the Amazon's ability to soak up carbon survive warming? A devastating 2010 drought may have stunted the planet's "green lungs." Photo courtesy of the National Oceanic and Atmospheric Administration. First in a series of stories about carbon sinks and sources. Read part two here and part three here. BOULDER, Colo. — The main tracking center for greenhouse gases in the Earth's atmosphere is housed in a laboratory here, filled with thousands of large glass flasks and the equipment to test the air samples in them. It has been run by the National Oceanic and Atmospheric Administration for almost 40 years and has given birth to a growing body of science that can assess the failures and the triumphs of mankind's battle against the dangers of global warming. It is a vast and unfinished business. Imagine, if you can, the life-giving blanket of air that surrounds our planet. It weighs 5 quadrillion metric tons. Ninety-nine percent of it consists of nitrogen and oxygen, and most of the blanket's thickness is in the bottom three-quarters of it. The top begins to taper off about 6.8 miles above the ground. What frightens, baffles and sometimes pits scientists against each other is the behavior of the gases they find in the remaining 1 percent. They are parts of a gaseous soup that includes carbon dioxide, methane and other accumulating gases, some of whose sources can be traced to human activities. They absorb the heat from sunlight and then radiate the heat back to Earth, raising its temperature in a process experts call "radiative forcing." What these gases do to the planet as they bake in the sunlight is only partly understood. CO2, which comes from fossil fuel combustion, is responsible for 65 percent of climate warming. Methane produces 15 percent. But when it is released, methane is 28 times more powerful as a warmer than carbon dioxide. Sixty percent of it is estimated to come from human activities. The methane content of the atmosphere has more than doubled since 1750, when the industrial age began. After a brief and still dimly understood plateau of about a decade, methane resumed its rapid rise again around 2007. Methane steadily increased from 1750 to the 1990s, when there was a brief period of constant concentrations, but methane concentrations are increasing again. Graph courtesy of NOAA. At the moment, this is among the bigger and more ominous mysteries lingering in the atmosphere. There are disputes among multiple scientists over the causes of the new rise, and there are conflicting studies about how to measure methane and trace it back to its sources. That could result in delays among policymakers trying to understand how to rank the activities they might regulate to reduce the mounting threat of global warming. The result could be tragic. On the flip side, there are gases like HFC-134a. Scientists know it is man-made because it is a refrigerant used around the world in automobile air conditioners. It was designed and marketed before the sources of climate change were well understood and has a global warming potential that, measured pound for pound, is 1,340 times more powerful than CO2. The stage is now set for international action this fall to replace it and its close relatives with a new refrigerant that should be relatively harmless. The result of that would be a triumph. The Boulder lab where these questions are being sorted out is run by NOAA's Global Monitoring Division, and it most closely watches the sources for the "greenhouse gases" generated by human activity. What makes the lab's work assessing the danger of CO2 sources more difficult are the "sinks." These are areas in the world that collectively absorb about half of the CO2 we emit every year and store them in places — including the depths of the oceans and in the billions of trees growing in forested areas. By 2003, NOAA's system to take regular air samples covered much of the globe in an effort to sniff out the behavior of the sinks, but there were still places on the Earth's continents where the contents and behavior of the atmosphere were mostly established by guesswork. As John Miller, a NOAA scientist working on global monitoring data here, put it, they were "voids." Some of them were huge, including the air swirling over South America's Amazon and over the jungles of Africa. 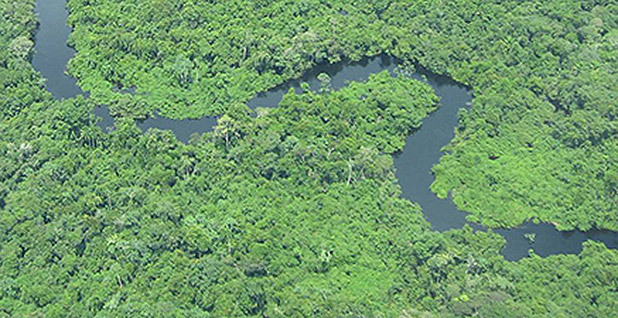 Brazil's Amazon, four times the size of Alaska, was the biggest question mark in Miller's puzzle. While some climate research was being done on the ground, trying to benchmark what was happening in the atmosphere was a challenge. Computer models predicting the impacts of climate change on the Amazon conflicted with each other, mainly because of a lack of prior observations. The question hanging in the air was: What was normal? In the United States, NOAA technicians obtained enough atmospheric samples to establish a benchmark by driving to remote areas and sometimes installing their air-sampling devices on television towers to get away from point sources of air contamination near the ground or in busy cities. They filled and tested as many as 20,000 flasks a year in an attempt to calculate the average power and accumulation of sources as they moved and mixed with the atmosphere. But the lack of roads in the Amazon made collecting a regular stream of samples more difficult, and there were relatively few towers that Miller and his team of researchers could use for a proposed experiment to fill the void. When they did have samples, they tried to set up regular shipments to test them in the Boulder laboratory, "but logistics were a nightmare," Miller recalled. 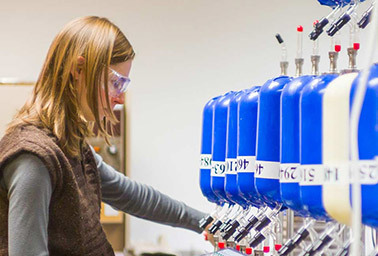 A technician works with glass flasks used by the National Oceanic and Atmospheric Administration's Earth System Research Laboratory in Boulder, Colo., to collect air samples from over 40 locations around the world. Photo courtesy of the Cooperative Institute for Research in Environmental Sciences. For the kind of testing Miller wanted to do, a regular schedule of sampling and testing was essential, so NOAA collaborated with Brazilian scientists to build a replica of Boulder's laboratory of glass flasks and testing equipment in São Paulo. The researchers, including a British team, decided to use aircraft to take samples, flying regular routes over four parts of Brazil's Amazon. They hired air taxis that connect cities and towns in the Amazon in much the same way that bush pilots connect places in Alaska. The air taxi pilots were trained to use automated sampling equipment, often used in remote places in the United States. Twelve of the flask-like bottles were loaded in black plastic suitcases with battery-powered pumps that would fill them. Computers controlled the pumps and outlined the routes and the places where the pilots should fly. "We had a small interface with the pilot that says, 'Now please go to 12,000 feet and press the button,'" explained Miller, who said the goal was to get representative air samples from fixed places along the routes. The researchers booked air taxi flights every two weeks between 1 and 2 p.m., a time when their calculations showed that the atmosphere would be thoroughly mixed with few temperature inversions to trap areas of stagnant air. "Then you're measuring something that's homogeneous, so it's more representative," added Miller. "You need to have a baseline." To enhance the accuracy of the baseline — data that could be used to compare samples of future Amazon air to see the ratio of gases over it as the climate changed — the researchers decided they had to find a way to subtract exterior contaminants in the winds blowing westward into Brazil from the Atlantic Ocean and Africa. They did that by using atmospheric data from Barbados, the Ascension Island and South Africa. The systematic measuring began on one Amazon route in 2001 but expanded to four routes beginning in 2010. This was sheer dumb luck from a scientific point of view because that was the year when Brazil's Amazon was hit by an extreme drought, and by then Miller's team had set up a laboratory and a baseline to measure what happened next. They were prepared to take 1,500 air samples a year for the next four years. Up to that point, the orthodoxy of climate studies, both from scientists and environmental activists, was that the Earth's sinks, particularly from oceans and forested areas, provided what Miller called "a 50 percent discount on our climate emissions." They kept about half of the greenhouse gases from further accumulating in the atmosphere. "We were getting a hell of a lot of help, and we didn't know exactly from where or why, and we don't know the extent to which it will last," explained Miller, who said that without the contribution from the sink, the world's leaders would now be wrestling with a buildup of atmospheric CO2 sources at around 550 parts per million, rather than the current 400 ppm. 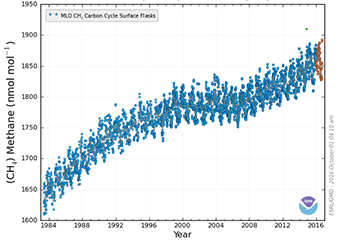 NOAA has measured the rise of CO2 levels since the 1960s. 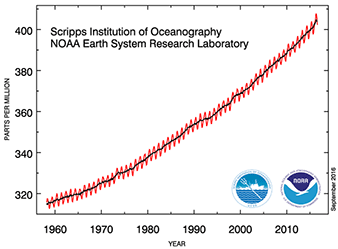 Graph courtesy of NOAA. What the 2010 data indicated from the Amazon, however, was that the sinks that are helping to cool the Earth may not survive more extreme weather. From January to May in 2010, half of the days saw temperatures well above long-term averages. Air samples showed the forests were giving off CO2, not absorbing it, and the flow of CO2 into the air was accelerated by smoke from many forest fires that spread quickly as the forests dried. In August, during the Amazon's dry season, the CO2 emissions intensified. Relatively suddenly during 2010, the Amazon had shifted from becoming a sink to becoming one of the globe's CO2 sources. Scientists believe the smoke, the added heat stress and the drought slowed the photosynthesis that normally stored CO2 in trees, sending substantial quantities of it back into the atmosphere instead. A later Stanford University study of the 2010 Amazon drought, using the Brazilian data, found the shifts from sink to source were "very large" and "surprisingly fast." Although the drought and the heat eased the following year, air samples continued to show "large pulses" of CO2 were still being emitted into the air above the eastern Amazon throughout 2011. Caroline Alden, a University of Colorado scientist who worked with Miller on the measuring project, warns that this could be a "legacy" effect that means that tropical jungles could take several years to recover from more severe droughts. To be sure, jungles also resume their plant growth very quickly, beginning with grass fields that can start to become wooded areas in three to four years. These are sometimes called "secondary forests," but the losses from a more extreme weather event like the 2010 drought — as it was measured in the glass flasks filled in 300 flights over the jungles in three years — showed that the renewed growth of a traditional carbon sink may not start quickly enough to offset losses from its sudden and severe collapse. Or, as Miller puts it: "It can return to being a sink, but to recapture all of the carbon that was taken away in the initial step, that takes a long time." Tomorrow: The enduring mysteries of methane.